The UK will see a new 2014 Subaru Outback with new styling and a fuel-efficient diesel mated to a CVT automatic for the first time. 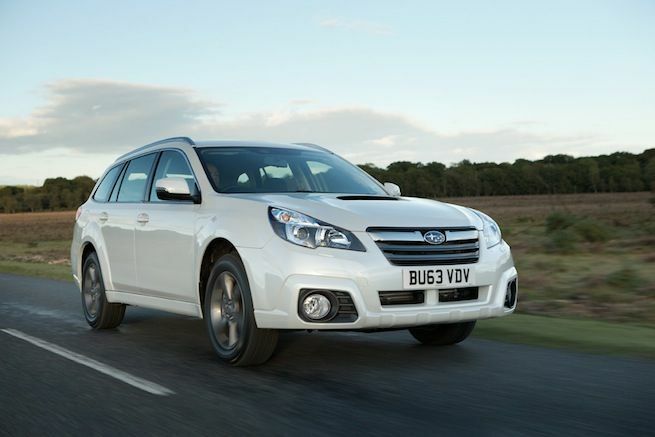 When the new 2014 Subaru Outback arrives on November 1 in the UK, it will have a tougher look and a new diesel automatic for the very first time. The Outback was launched in Europe in 1996 and has been on a steady climb up the mountain as a popular all-wheel-drive crossover. Now, it get some visual upgrades outside and new diesel with a CVT for more fuel-efficiency in the UK. The new 2014 Outback arrives in the UK on November 1 with new body-colored cladding in place of the previous iteration’s black plastic. It also comes with a two new colors, Deep Sea Blue Pearl and Dark Grey Metallic. The exterior of the crossover also features new larger fog lamps and the addition of a gloss black finish to the front headlamps. The alloy wheels now have a gunmetal finish as standard. The cabin of the all-whee-drive Outback also gets upgraded. It now features clearer and more modern instrumentation, including the addition of a liquid crystal instrument cluster display and new materials for the dashboard elements. 2014 Outback interior also gets black metallic panels, while instruments within the cockpit have been moved to improve user-friendliness. The big news for the new Outback is the 2.0-litre Boxer Diesel comes mated to Lineartronic CVT for the first time. Subaru engineers have combined the popular 2.0-litre Boxer diesel engine with a Lineartronic CVT (continuously variable transmission). They also made improvements to ride quality and driveability with new chassis upgrades through alterations to the car’s front and rear suspension. Who says you can’t have an efficient all-wheel-drive vehicle? The new 2.0D SX Lineartronic is fuel-efficient and returns up to 44.8mpg (combined) and 166/km CO2. It also features versatile interior cargo space and superior on-road handling of a family estate with the off-road capability and ground clearance of a sports utility vehicle. Subaru is constantly upgrading their product line and for the 2014 model year, Subaru engineers have now realized further improvements to the Outback, enhancing the car’s handling characteristics with revised suspension components and the latest incarnation of Subaru’s Vehicle Dynamics Control. The 2.0D diesel mated to the new CVT makes it a fuel-efficient all-weather family estate. Pricing starts at 29,995 British pounds on the new 2014 Subaru Outback 2.0D SX Lineartronic and is available in the UK on November 1.